Wahl Aloe Soothe Shampoo is a carefully balanced formula developed to support your pet by conditioning their skin; calming any irritation and relieving any skin issues as it cleans. Based on natural ingredients including avocado and coconut to moisturise the skin, and wheat germ extract to deodorise the hair, Wahl Aloe Soothe also contains aloe vera gel that will soothe and cool the skin as the shampoo gently removes dirt, grease and stains from the coat. Wahl Aloe Soothe Shampoo also contains beneficial ingredients such as Vitamins E and C that will work with the aloe to promote healthy, glossy results every time. 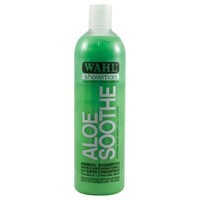 Please Note: Wahl Aloe Soothe Shampoo is a concentrated formula that will need diluting before use.